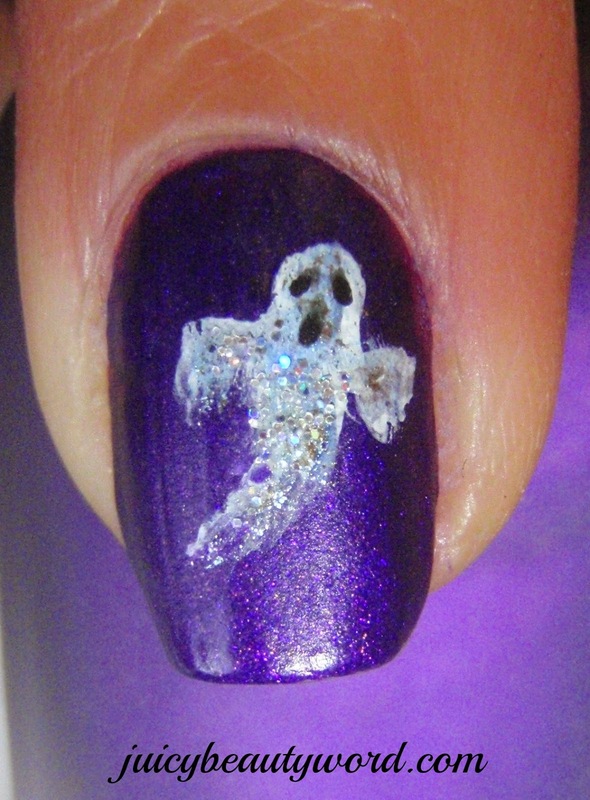 Here are my shimmering ghost nails to celebrate Halloween! I love how each one seems to have its own personality. I polished my nails with Zoya Matte Velvet Lacquer in Savita. Savita has been discontinued. Try Zoya Iris Matte velvet. The deep purple matte finish is gorgeous. It makes a perfect background for my little ghosts. I started my design by painting each ghost with white acrylic craft paint. Dots black acrylic paint made the eyes and mouths. I find acrylic paint easy to work with when painting small designs. Then came the glitz. Bits OPI Birthday Babe and Zoya Hazel were dabbed on each ghost with a paint brush followed by a little loose iridescent silver glitter. 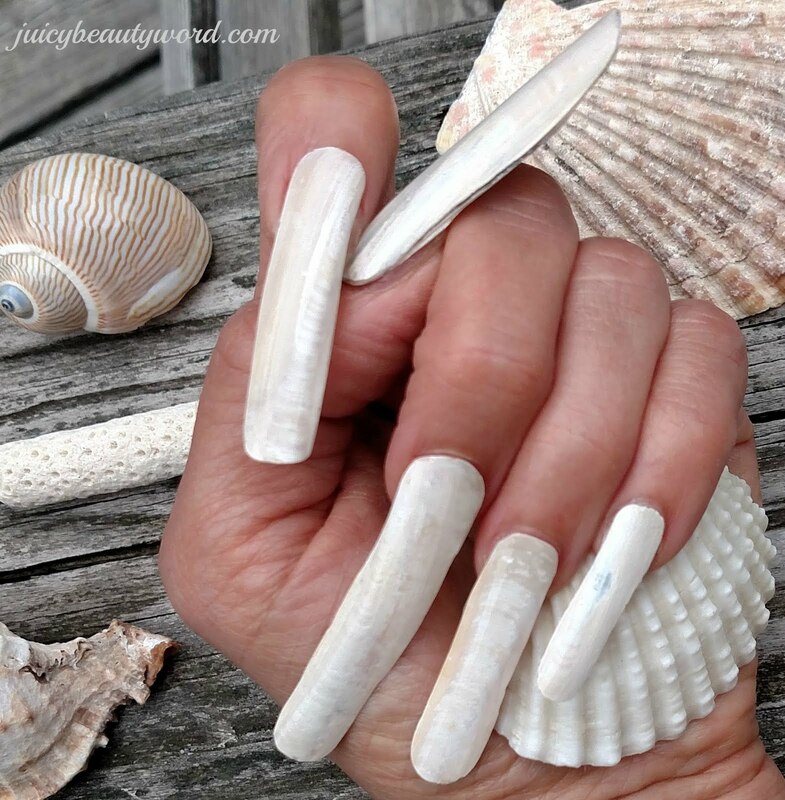 No top coat is used with matte polish to keep the nice matte finish. OPI Birthday Babe has been discontinued. 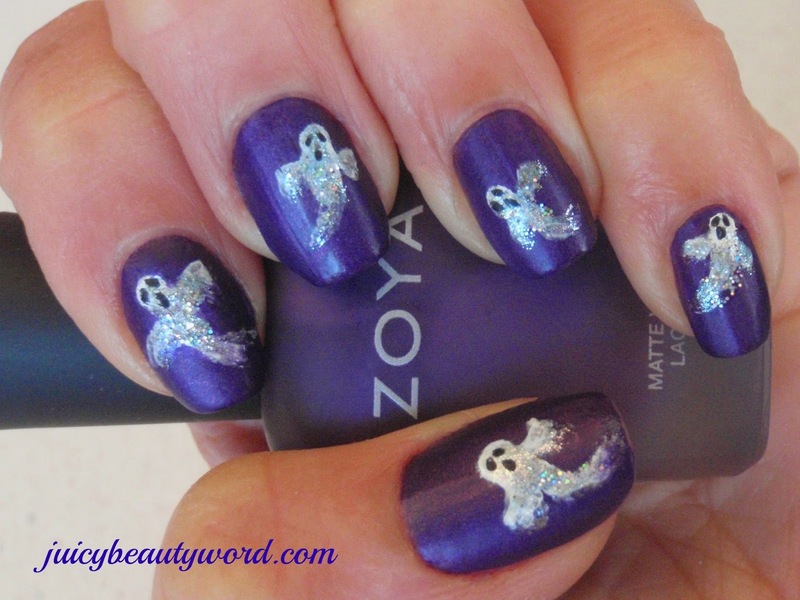 Try Zoya Cosmo Magical Pixiedust. Click here to see my candy corn nail designs! 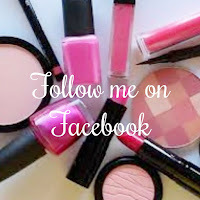 Looking for a fabulous bright pink lip color? Look at this gorgeous fuchsia! No faded looking pink here. Just nice bold color. I just love it. It's Razzle Fiesta from NYX Butter Lipstick. 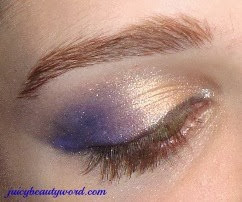 It is smooth and creamy with lots of pigment and shine. Update: This awesome color has been discontinued. Try Sweet Shock in the NYX Butter Lipstick. It's a bright Fuchsia. $6.50 at Ulta and NYX.com. 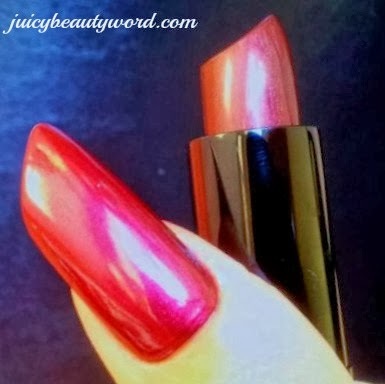 I also like Urban Decay Vice Lipstick in Frenemy and Anarchy to get the same look. $17.00 at Ulta and Urban Decay.com. Nothing says Halloween like dark lips and nails. You can become dark and vampy in an instant! I like to use inexpensive makeup to create fun Halloween looks. Why spend a lot of money on colors I will only use a few times, right? The Halloween stores are one of my favorite places to get crazy makeup. Most of them carry Fantasy Makers from the creators of Wet n Wild. It's fun stuff. Glittery shadows and ghoulish black lipstick. You can get great funky eyelashes there too! Drug stores also carry fun makeup and lashes in their seasonal section in October. 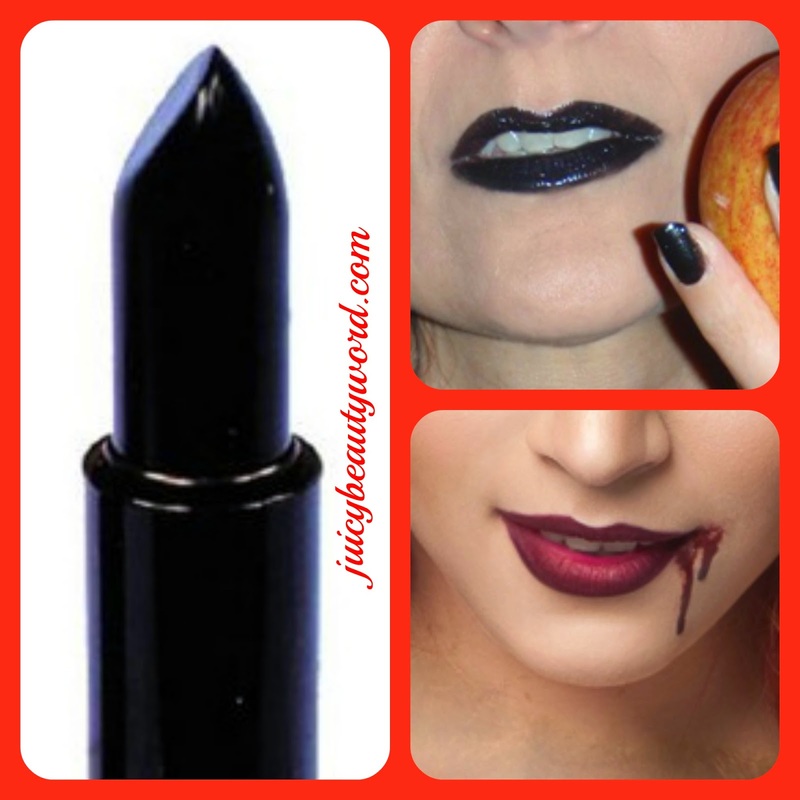 You can shop for black lipstick and other theatrical/costume makeup online anytime. Amazon has a great selection. Other great in expensive brands are Wet n Wild and NYX. Find Wet n Wild in drugstores and NYX at Ulta stores. Wet n Wild Ebony Hates Chris 229C It's a super fast drying black cream. Wet n Wild Black Creme 485D It's a shiny black cream. Wet n Wild Megalast Lip Color Vamp It Up It's not black but it's a fabulous dark purple. Wet n Wild Fergie Perfect Pout Lip Color A041 Ferguson Crest Cabernet A deep, dark red. Q. My salon offers paraffin wax treatments. Is paraffin wax the same as the wax they use for hair removal? A. Paraffin wax and hair removal wax are two different types of wax. Paraffin wax is a soft non sticky wax. It is a petroleum product like petroleum jelly. Candles can be made of paraffin. It is used in salons and spas as a treatment for dry skin and as therapy for arthritis. Paraffin hand dips are very popular. The hands are dipped into hot paraffin wax, then placed in plastic bags. Hand mitts can also be added over the plastic bags. To avoid many hands being dipped into the same wax, some salons ladle the melted paraffin into plastic bags and then place the bags on the hands of their client. 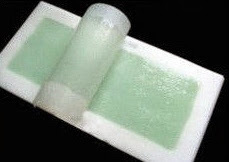 The paraffin wax cools and solidifies and is easily removed from the hands. The hands are left warm and moisturized. 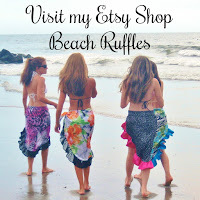 It is fabulous on feet too! Hair removal waxes are sticky or they harden. They usually made from resin. The wax is applied to the skin, it sticks to unwanted hair and is pulled off removing the hair. Soft wax is one type of wax used in hair removal. It never completely hardens when cool. It is warmed up in a wax pot. The warm wax is applied in a thin layer to the skin and is removed with a cloth strip. Because it is does not harden, it sticks to the skin and exfoliates dead skin cells during the hair removal process. Cold wax is also a type of soft wax. Generally, cold wax is pre applied to the waxing strips. It is not as effective as warm wax hair removal. It is an easy at home type of hair removal. Hard wax is also a type of wax use in hair removal. This type of wax is very hard when it is cool. It is melted in a wax pot. The warm wax is applied in a thick layer to the skin. It is allowed to cool slightly, then is pulled off the skin. No cloth strip is used. Many people say they like hard wax because it hardens around the hair not sticking to the skin making it more gentle on the skin. 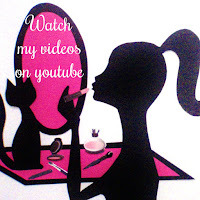 My favorite wax to use for hair removal is soft wax that is made for sensitive skin. I find it gentle, thorough and easy to work with. 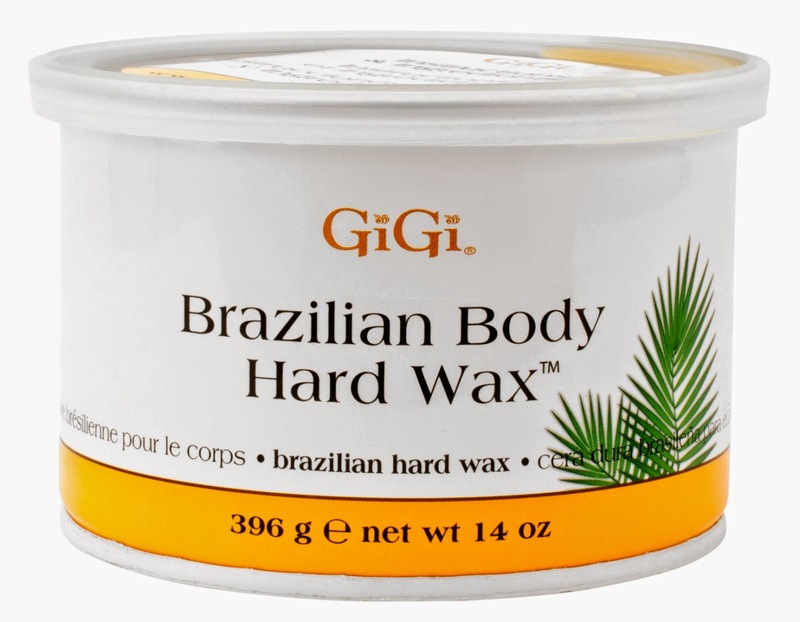 Gigi is my favorite brand of wax. Visit waxing etc for waxing and hair removal tips. See me at Styling Point in Media, Pa for paraffin treatment and hair removal waxing. Those nasty lip wrinkles! Vertical lines around your lips that happen as our skin ages. They get worse if you frequently make a puckering motion with your lips such as when smoking a cigarette, drinking from a straw and whistling. Collagen and elastin production in our skin decreases as we age causing the skin to line, wrinkle and sag. First of all, you must quit smoking. 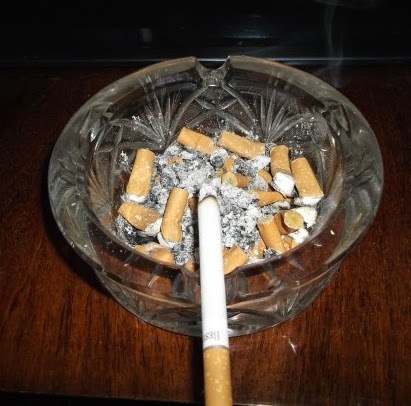 Cigarettes not only cause the puckering motion of the lips, cigarettes breakdown collagen causing lots of wrinkles! There are some easy things you can do to make lip wrinkles look less noticeable. Ditch the straws and try not to whistle so much. No smoking! An injectable dermal filler, such as Juvederm, can fill in the lines and increase collagen production. Fillers temporarily smooth the lines maybe up to a year. A doctor performs this service. You can also smooth them by having a laser treatment. Lasers resurface the skin, tighten and build collagen. 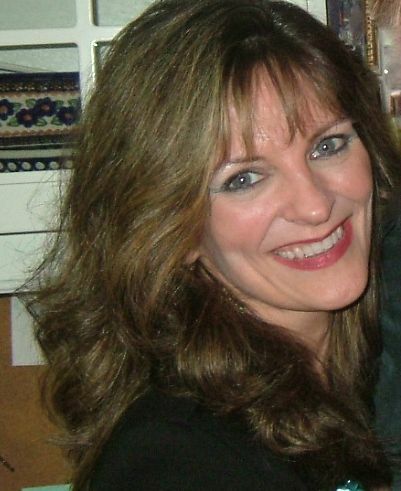 A trained nurse, esthetician or doctor perform laser services in a doctor's office or med spa. There are a few things you can do to at home to improve the appearance of lip wrinkles. Use a serum and moisturizer that contain hyaluronic acid to plump up the skin. 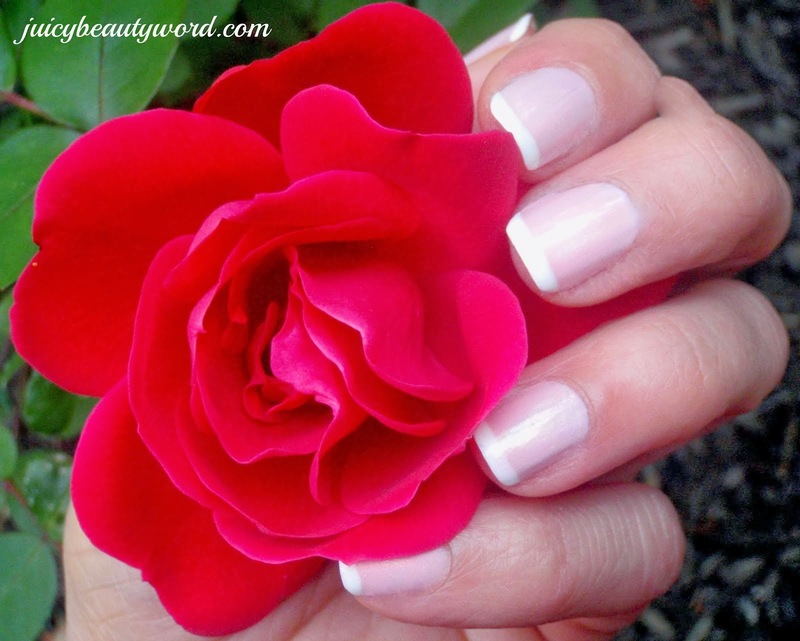 Moisturized plumped up skin hides wrinkles. Peptides, ceramides and retinol are also good ingredients to look for in wrinkle reducing skincare products. Dr Dennis Gross Hydra Pure Firming Serum contains hyaluronic acid, peptides and lots of anti oxidants. Derma E Hydrating Day Cream with Hyaluronic Acid is a nice natural moisturizer to try. There is a night cream too. Removing dull dead skin cells always makes the skin look younger and fresher. 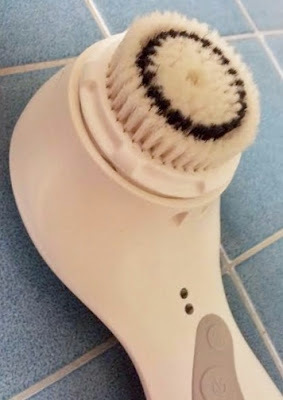 Try a cleansing brush such as Clarisonic. Try a soft gel peel to exfoliate. One of my favorite skincare products is Yonka Gommage . It's a gentle effective peel and has no grains in it to scratch the skin. 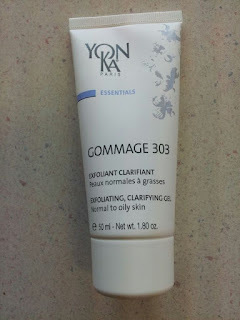 Yonka Gommage 305 is the dry, sensitive skin formula and 303 is the normal, oily skin formula. Both are an excellent soft peels. You can also mix up your own sugar scrub to exfoliate with. I prefer brown sugar over white granulated sugar for facial scrub because it's less gritty. Mix brown sugar and olive oil together in a small bowl until smooth. Wet your lips. Apply scrub to your lips. Massage the lips and lip line in a circular motion for 30 seconds. Rinse, pat dry and apply moisturizer. Use sunscreen daily. 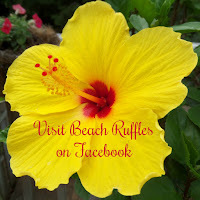 Ultra Violet radiation from the sun ages our skin and causes wrinkles. A BB cream is great for daily use. 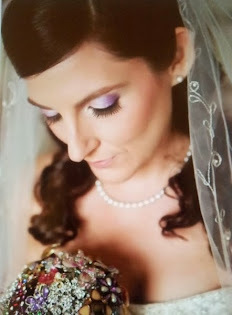 BB creams are multi purpose skin care creams that contains sunscreen.